Come play bocce with your friendly, neighborhood Writing Center tutors! If you can throw, toss, bowl, or just generally roll a ball, you can play bocce! 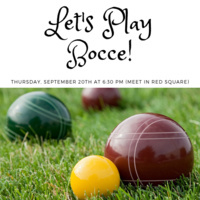 Still not quite sure what bocce is? Neither are we, actually … but Vanessa promised to show us and assures us that it’s fun. We’ll be meeting in Red Square at 6:30 pm on Thursday, September 20th, and from there, we’ll look for a good grassy spot.